PURPOSE: The purpose of this study was to evaluate short term results of the laparoscopic surgery for biliary tract cancer. 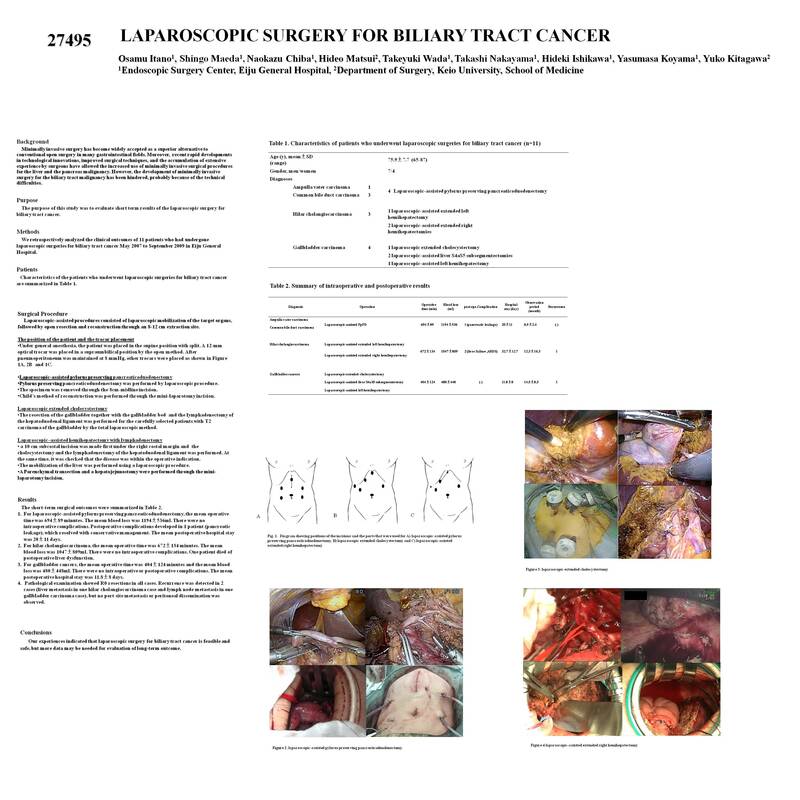 METHODS AND PROCEDURES: From May 2007 to September 2009, there were 11 laparoscopic surgeries for biliary tract cancer carried out at our hospital. Laparoscopic-assisted pylorus preserving pancreaticoduodenectomy was performed for one ampulla vater carcinoma and three common bile duct carcinomas. One laparoscopic-assisted extended left hemihepatectomy and 2 laparoscopic-assisted extended right hemihepatectomies were performed for 3 hilar cholangiocarcinomas. One laparoscopic extended cholecystectomy, 2 laparoscopic-assisted liver S4aS5 subsegmentectomies, and 1 laparoscopic-assisted left hemihepatectomy were performed for 4 gallbladder cancers. Laparoscopic-assisted procedures consisted of laparoscopic mobilization of the target organs, followed by open resection and reconstruction through an 8-12 cm extraction site. RESULTS: For laparoscopic-assisted pylorus preserving pancreaticoduodenectomy, the mean operative time was 694±89 minutes. The mean blood loss was 1194±536ml. There were no intraoperative complications. Postoperative complications developed in 1 patient (pancreatic leakage), which resolved with conservative management. The mean postoperative hospital stay was 20±11 days. For hilar cholangiocarcinoma, the mean operative time was 672±134 minutes. The mean blood loss was 1047±809ml. There were no intraoperative complications. One patient died of postoperative liver dysfunction. For gallbladder cancers, the mean operative time was 404±124 minutes and the mean blood loss was 480±448ml. There were no intraoperative or postoperative complications. The mean postoperative hospital stay was 11.8±8 days. Pathological examination showed R0 resections in all cases. Recurrence was detected in 2 cases (liver metastasis in one hilar cholangiocarcinoma case and lymph node metastasis in one gallbladder carcinoma case), but no port site metastasis or peritoneal dissemination was observed. CONCLUSION: Laparoscopic surgery for biliary tract cancer is feasible and safe, but more data may be needed for evaluation of long-term outcome.